Where does the time go? The Summer has come and gone and we are getting into the cool and wet weather of the Fall. Laura and I still receive many client inquiries every week re large landscape projects, most containing some sort of hardscape element. Hardscape is a term we use referring to all of the non-living, but crucial, elements of a landscape master plan. 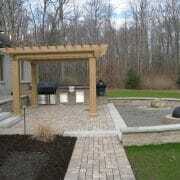 Patios, decks, pool placements, fire pits, pergolas, pavilions, pizza ovens, outdoor kitchens, and others. 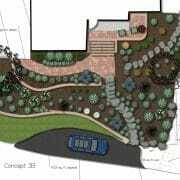 Our landscape design packages typically provide several different plans with different approaches to your space. These plans may take 6 weeks or so to complete (since we are continually working on plans and managing projects from earlier clients). With the time needed for possible revisions to the plans once we present it, you can see the process takes time. We advise clients from mid-September on to let us plan their landscape project over the Winter for Spring installation. Planning your Spring landscape project over the Winter allows you to carefully explore costs, weigh options, and get a well qualified contractor in place. Considering the low end cost of this class of project is $10,000 typically it is not something you want to rush! We work with some of the best hardscape installation contractors in the Capital District and stay up to date with materials, lighting, and outdoor kitchens. Fill out our landscape questionnaire today and we’ll get you ready for Spring! 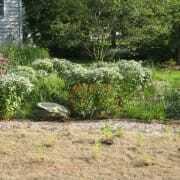 The Best Native Pollinator Perennial that is Deer Resistant What is a Permeable Paver Patio?